RICHMOND, VA – The Richmond Kickers hosted West Bromwich Albion from the English Premier League and fought hard but a 88th minute goal by Brown Ideye would seal the Kickers 2-1 loss. Scoring was opened by James McClean from WBA in the 14th min but a Nate Shiffman volley in the 84th minute would equalize until the late game-winning goal. The game was delayed in the 4th minute for an hour due to lightning strikes in the area. The opening goal from James McClean happened after he brought the ball up the right touchline, cut back in to beat a defender, and nailed a shot 30 yards out that went up and over Ryan Taylor. After conceding the early goal the Kickers only chance in the 1st half went down in the 21st minute as George Davis IV came up the left side, feed a through ball to Fred Owusu Sekyere who found Jason Yeisley for a header that went just to the right of the post. Plenty of fouls would happen in the 1st half as both sides tallied six, including a yellow card for Callum McManaman in the 42nd minute after shoving George Davis IV to the ground as the two fought for a loose ball. The Kickers set piece defense would be in top form as they fought of two corners which included a deflection from Hugh Roberts. WBA had an additional chance in the 1st half after a rip from 25 yards out from Saido Berahino in the 28th minute went well wide left of the upright. The 1st half would end nearly 2 hours after it started due to the weather delay. 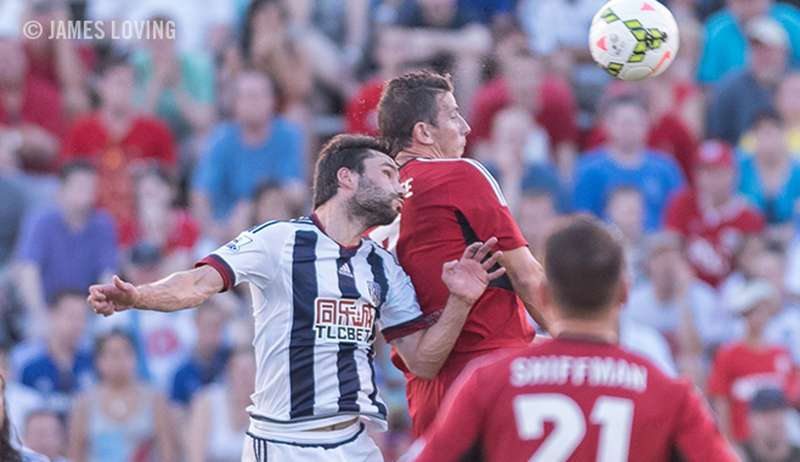 The 2nd half was marked by massive substitutions for WBA that started in the 51st minute and would tally up to seven. After the first round of subs the Kickers would earn their first chance of the 2nd half after Braeden Troyer hit Yudai Imura with a through pass with the subsequent shot going over the bar. The Kickers tied the game in the 85th minute after a one-timer from Fred Owusu Sekyere found Alex Lee who perfectly crossed the ball to Nate Shiffman who knocked it in from the back post. The game-winning goal for WBA happened in the 88th minute after Brown Ideye header found the net following a whipped pass from Stephan Sessegnon from the right. During a string of substitutions from the Kickers in the 86th minute Richmond United players Andrew Romig (GK) and Chris Durkin (M) made their professional debuts. The Richmond Kickers will go on the road to face New York Red Bulls II on Saturday, July 25th before returning to City Stadium to host the Harrisburg City Islanders on Saturday, August 1st for Craft Beer Night presented by Loveland. Tickets are on sale now at RichmondKickers.com.